Last Friday night, Trish called to let me know that a knit night was happening in the Distillery District. In the really amazing shoe store. Catered by the really amazing bakery. With giveaways and limited-edition yarn for sale. And it was just about to start. We both had other plans, but for five wonderful minutes we talked over how we could make it happen - ditching those other commitments and the people (in Trish's case, real live ones) who expected us to be around for them, Trish driving downtown and parking in the lot under my building, the two of us walking alongside the probably very darkened park for the 15 minutes it would take to get there... you know. The usual. Then we said goodnight and I went back to what I'd lined up. You don't even want to know how long it took me to clear off this sofa, aka 'clean laundry station' and 'discarded wardrobe ideas depot'. I considered it a point of virtue to put in the time required to do it, kind of like I would be earning back the right to sit and run in ends if I did it. Key to this whole process was setting up a DVD of 'Middlemarch'. I don't love this production, and in fact feel quite annoyed at all the people in the story who make stupid marriages, but hello: COSTUME DRAMA. Here's the thing. 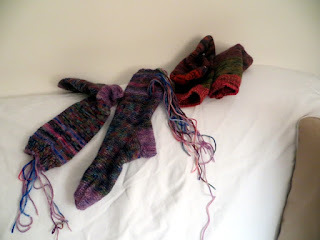 Condo living has been a refreshing change from being in a house, but I have been getting alarmed by the complete disconnect from my old routines, many of which revolved around maximum knitting time. And maybe an hour a day just for writing Hugs. There are so many distractions downtown! I can't remember the last time I sat down with a good costume drama and a project. I'll tell you another thing, too. There is a direct connection between how interested I am in the audiobook queued up in my Audible app and how tidy my kitchen looks. 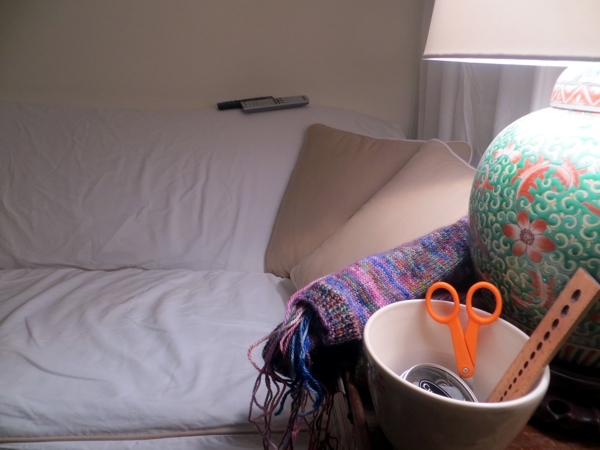 Last week the snowdrift-like crest of mail, magazines, discarded sweaters, and completed shopping lists on the kitchen table and the desk I keep in there was equaled only by a three-day accumulation of pots and lunch thermoses on the counter. So on Friday, between bouts of laundry-folding, I invested some time at Amazon and Audible and set myself up with a few audiobooks (Garry Marshall's My Happy Days in Hollywood, Sophie Kinsella's I've Got Your Number, and David Sedaris' When You Are Engulfed In Flames) as well as some e-books because I was out of those too. Result? By midafternoon on Saturday, I had an incredibly clean kitchen, and a full day's worth of laundry done all the way from machine to closet. Thank you live story-telling. Thank goodness. Two and a half socks down, one and a half to go. Not thinking about the ton of Vesper toes to close up, all clustered optimistically in a basket on the floor beside the sofa. 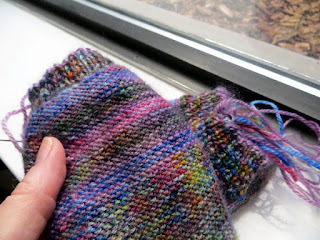 Saturday night, I managed to get a lot closer to finishing sock number three. Good thing Middlemarch runs a few hours, isn't it? 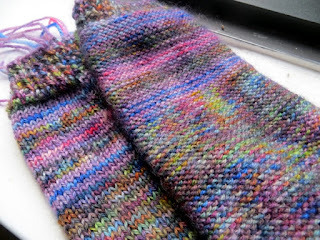 I really need to find a different way to manage stripes, like running in ends as I go, or not doing stripes at all. On the other hand, they are SO PRETTY, even when inside out. 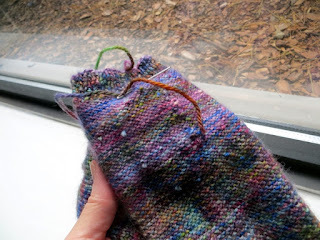 I know I say this every time, but I think the purl side of a knit, especially with a colour-flecked yarn like this, is so much more beautiful and soft than the knit side. Oh well, better get back to it. Or rather, back to all the stuff that keeps getting left undone, and creating a barrier between me and finishing all those otherwise finished socks. TV, movies, audiobooks, softly rustling leaves... what's your favourite accompaniment to running in a lot of loose ends? Hallmark Christmas movies? They don't require a lot of attention, but make a nice background for the fiddly bits. So true Mimi! I have been watching The Good Witch for mindless decompression work over the last few months... I draw the line at Cedar Cove though ;^) Gorgeous scenery but holy crow the script!